for a high pitched twittering sound overhead. This sound is Chimney swifts chasing down insects which they gobble up in midair. These “cigars with wings” have a distinct, torpedo-like body with long, thin, curved wings and are amazing flyers. 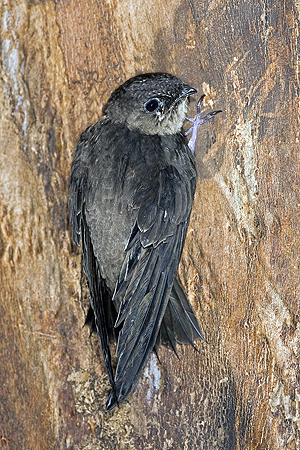 Chimney swifts don’t perch, but have the ability to cling to the sides of rough surfaces. Originally they nested in hollow trees, but with urbanization they began nesting almost exclusively in the inside of chimneys gluing their nests to the inside of chimneys with a sticky saliva. But with the invention of central heating, our use of chimneys has declined, and most new chimneys are too narrow for Chimney Swifts to use. With fewer places to nest, their population has declined by half in the past 40 years. You can help Chimney swifts by building a Chimney Swift tower which looks similar to a chimney, but is basically a bird house and roost box for Chimney swifts and is also used for staging for migration. You can get as creative as you want with the exterior, but the insides of the tower must be rough as Chimney Swifts don’t perch, but will cling to the inside of your tower. And it must be insulated to protect the adults and nestlings from extreme temperature changes. Here are some videos on building a tower. And here are some cool pix by Audubon Minnesota of towers built by Eagle Scouts, community groups and home owners for their backyards. This is a more advanced backyard project, and in some instances may require community permission due to the height, but the effort can be of great help to the declining populations of these birds. It’s a bit of work, but well worth it. Chimney swifts eat about 1/3 of their weight each day in insects, so a swift tower can be a very practical addition to your community. Talk to your friends and see if you can’t start a community Chimney swift tower project!